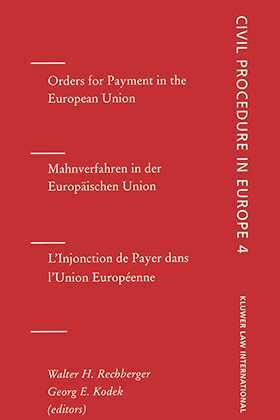 This important book, the fourth in the Civil Procedure in Europe series, provides a comparative overview, for 15 EU countries, of orders for payment Mahnverfahren and similar proceedings. Each country's practice in this area is described and analysed by a national expert distinguished in the field of civil procedural law. The contributions are written in either English, French, or German, and are followed by summaries in both remaining languages. Bibliographies are included to enable the reader to locate material for further study. res judicata, enforceability and other effects of orders for payment. A comparative contribution by the editors analyses the similarities and differences between the various European systems. Furthermore, the editors discuss attempts to harmonise the law of civil procedure in this respect, which range from various recommendations of the Council of Europe to the 1998 draft of the Late Payment Directive, and provide concrete suggestions for a future harmonisation or unification of this area of the law. The countries covered are Austria, Belgium, Denmark, England, Finland, France, Germany, Greece, Italy, Luxembourg, The Netherlands, Portugal, Spain, and Sweden.